When posed with the question as to who it was who actually took the very first photograph, there is little argument today that it was Joseph Nicephor Niépce. Niépce was born in France on March 7, 1765. He was one of three children with a father who was a wealthy attorney. The family was forced to flee the area when the French revolution began. Niépce was named Joseph, but while studying at the Oratorian College in Angers, he decided to adopt the name Nicéphore in honor of Saint Nicephorus the ninth-century Patriarch of Constantinople. His studies taught him experimental methods in science and he graduated to become a professor at the college. Niépce served as a staff officer in the French army under Napoleon. During his years in the service, the majority of his time was spent in Italy and on the island of Sardinia. He resigned his post due to illness. After leaving the service he married Agnes Romero and became Administrator of the district of Nice. He left this position to further pursue scientific research with his older brother Claude at their families estate in Chalon. He was reunited at the family home with his mom, sister and younger brother Bernard. Not only did he pursue his scientific research, but he also managed the family estate. The brothers served as wealthy gentlemen-farmers, raising beets and producing sugar. Niépce is believed to have taken the world’s first photographic etching in 1822. Using a camera obscura, a box with a hole in one side which utilizes light from an external scene, he took an engraving of Pope Pius VII. This image was later destroyed by the scientist when he attempted to duplicate it. Two of his attempts did however survive. One was a man and his horse, and the other a woman sitting at a spinning wheel. Niépce’s main problem was an unsteady hand and weak drawing skills, which led him to attempt to find a way to capture images permanently without relying on his poor drawing skills. Niépce experimented with the use of silver chloride, which darkened when exposed to light, but found it was not sufficient to produce the results he desired. He then moved on to bitumen, which led him to his first successful attempt at capturing a nature image. His process involved dissolving bitumen in lavender oil, which is a solvent often used in varnish. He then coated a sheet of pewter with this mixture and placed it inside a camera obscura. Eight hours later he removed it and washed it with lavender oil to remove any unexposed bitumen. The picture itself was not very memorable as it was a building, a barn, and a tree. It was believed to be the courtyard outside his house. However, since the process was such a slow one, taking over 8 hours, the sun moved from one side of the image to the other making it appear as if the sun was coming from two sides of the photo. This process would later inspire Louis Daguerre’s highly successful mercury vapor development process. Once Niépce had the success he desired he decided to travel to England to try to promote his new invention to the Royal Society. Unfortunately, he was met with total failure. The Society has a rule stating that it would not promote any discovery with an undisclosed secret. Certainly, Niépce was not prepared to share his secrets with the world, so he returned to France disappointed that he was unable to make a success of his new invention. In France, Niépce formed an alliance with Louis Daguerre. In 1829 they began collaborating to improve the process. They remained partners for the next four years until Niépce’s death from a stroke in 1833 at the age of 69. 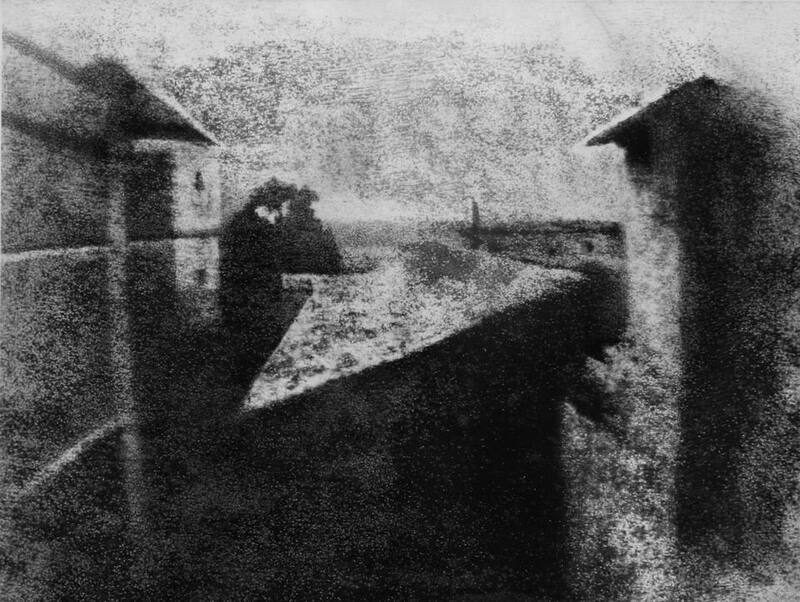 Daguerre continued working on the process after Niépce’s death eventually developing a process that, although based on their original findings, was much different than what Niépce had created. He named it the Daguerreotype, after himself. He managed to get the government of France to purchase his invention on behalf of the people of France. In 1939 the French government agreed to pay Daguerre a yearly stipend of 6,000 Francs for the rest of his life, and to pay the estate of Niépce 4,000 Francs yearly. Niépce’s son was not happy with this arrangement, claiming that Daguerre was receiving benefits for what his father had created. Niépce actually received little credit for anything to do with this creation until 1952 when historians Alison and Helmut Gernsheim rediscovered Niépce’s original images. It was this discovery that allowed the world to learn about Niépce’s "heliographic" process and allow the world to realize that this was the first successful example of what we now call photography: an image created on a light-sensitive surface, by the action of light. Although Niépce is most noted for his invention in the photographic area, he also had several previous successes as an inventor. Among Niépce's other inventions was the Pyreolophore, the world’s first internal combustion engine, which he conceived and created with his brother Claude. Emperor, Napoleon Bonaparte, granted his patent in 1807 after he was shown its ability to power a boat upstream on a river in France. In honor of this photographer, The Niépce Prize Niépce was created and has been awarded annually since 1955 to a professional photographer who has lived and worked in France for over 3 years. It was introduced in honor of Nièpce by Albert Plécy of the l'Association Gens d'Images.